The success of the retooled Mexican Revolution hinges on executing the largest vanishing act the world’s ever seen, right under General Obregon’s nose. Viva this! Today I welcome you into the growing number of people who’ve made that discovery. As means of introduction, let me just say some conspiracies remain theories. Others become obsessions. Exhumed 100 years after their penning, the Lost DMB Files will reinterpret the way you see the world (or the way it sees you). During the 1930’s dime novelist and pulp fiction writer, David Mark Brown (no relation that I know of), mysteriously disappeared. Until recently, his obscure writings had all but been forgotten. The Truth in History Society contends his pulpy brand of fiction preserves a secret history, a history able to reclaim our future (if the war it has unleashed doesn’t destroy us in the process). One thing is for sure. These double-barreled western, dieselpunk thrillers are an unadulterated joy to read. And while each lost file can be enjoyed on its own, together they provide an intriguing reinterpretation of history. As they say, the truth shall set you free! In much the same manner that Reefer Ranger introduces the reader to a key character within the Lost DMB File universe, Del Rio Con Amor introduces us to Del Rio “Chancho” Villarreal. Unlike J.T. McCutchen, no historical connection to Chancho Villarreal has been made with certainty. This could be due to the fact that he is entirely fictional. Or, as I believe, it could be due to obfuscation by both David Mark Brown and the power players he worked feverishly to expose. Neither “Del Rio” nor “Chancho” seem convincing as actual monikers, and its equally likely that Villarreal is also an alias. If Chancho was indeed a historical figure he would have certainly been a primary target of the mysterious group Brown later refers to as the “benefactors.” Jokingly, this fabled organization is most commonly referred to today as the Pentavorite. But all joking aside, it seems most likely to me that Chancho was either a projection of Brown himself, or a separate historical figure Brown felt a responsibility to protect via anonymity. Several possibilities for Chancho’s historical identity have been suggested, but I feel it unnecessary to speculate further. (What? Me, not speculate!?) Recent research has uncovered a handful of obscure references to the “Motorcycle Mexican,” an alias Brown uses for Chancho in his writings. I fully expect further examination combined with yet to be discovered “lost files” to reveal Chancho’s historical equivalent. Until then, I have no choice as editor for Del Rio Con Amor but to leave the text as discovered. Now you’ve done it, and I’ve blathered on entirely too long. 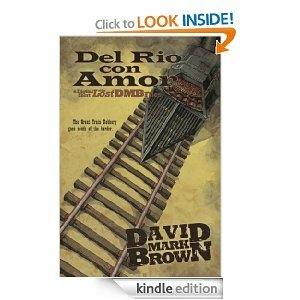 On a final note I must point out that the only known print version of Del Rio Con Amor was recently discovered by me among the ruins of a Catholic orphanage within the new borders of Coahuila. (But that’s a story for another time!) The orphanage, along with an entire village, had been underwater since the newly formed Democratic Republic of Texicas decided to create the Falcon Reservoir in 1923. Follow this link for more on the Lost DMB Files. And enjoy the show!